The NCIS investigation into stolen plans for an Unmanned Aerial Vehicle (UAV) got personal when a connection was made to the disappearance of a girl Sam protected when he was in Saudi Arabia. 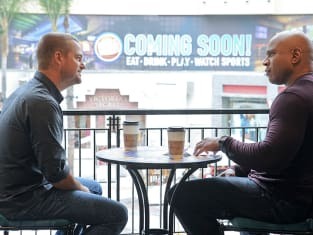 The situation became tense when Granger was convinced that the girl wasn't involved and even Callen questioned Sam's conviction on NCIS: Los Angeles Season 5 Episode 22. NCIS: Los Angeles Photos from "One More Chance"
The robbery of the plans was well orchestrated with an escape plan choreographed to a flare flash mob set up through Craig's List. The masks on the attendees allowed the criminals to get away even with the police showing up right away. Without a solid lead, NCIS started with the employees of the UAV program. Jessica Peyton, the program's lead engineer, was protected by Sam in Saudia Arabia. When she was questioned about her daughter's abduction by her father, Jessica played it off as a misunderstanding. She claimed that he was keeping her is a safe location and home-schooling her. Her explanation didn't make much sense and I thought she was covering for something, but Sam didn't believe she was lying. Even after evidence that Riley was kidnapped was found in the robber's van, Sam didn't think she knew her daughter was taken. NCIS traced a huge order of the chrome masks to an Edgar Ramirez. When Deeks and Kensi arrived at the mobile home, they saw what they thought was a man on the floor and entered. It wasn't a man, it was a dummy set to explode! Deeks pushed Kensi out just in time to save them both. The two partners were back to their regular banter after being reunited. It was fun to see them fall back into the groove of harassing each other a bit. Deeks definitely saved her this time, but we'd have to do a full review of their work history to see which of them has the life-saving record. It wasn't just a dummy found in the explosion. They also found Ramirez's arm and a computer with a video that proved that Riley was kidnapped. This was the clue they needed to solve the case and to save Riley. When Jessica was contacted by the kidnappers, it appeared the case would be quickly resolved, but they outsmarted NCIS. The message for Jessica was painted on the wall rather than sent my phone. She wasn't about to tip off NCIS and risk her husband and daughter's lives. It was fortunate that NCIS had a secret weapon they could use. The kidnapper's driver was in their custody and they used him to find the kidnappers. It was an intense bit between the time they lost Jessica and conned their way to find Jessica. It could easily have gone bad. When Sam found Riley, their reunion was touching. She knew he would find her and gave him the CD cover for good luck. Case solved. While it wasn't a particularly exciting episode, the case went in unexpected directions which made it engaging. The highlight was the interaction between Sam and Callen. Even though Callen questioned Sam, he ultimately believed and supported his gut feeling that Riley was taken. As Callen left for his date, Sam gave him the lucky charm that he received from Riley. A truly touching gift and a sign that maybe Callen has finally found his perfect mate. Wouldn't that be exciting? In contrast, Hetty and Granger continue to be at odds. Ever since they returned from Afghanistan, their working relationship has been strained. It was awesome to see that Hetty wasn't going to hold back after her made her send bad news up the line. She made sure to get the credit for the successful mission as payback. 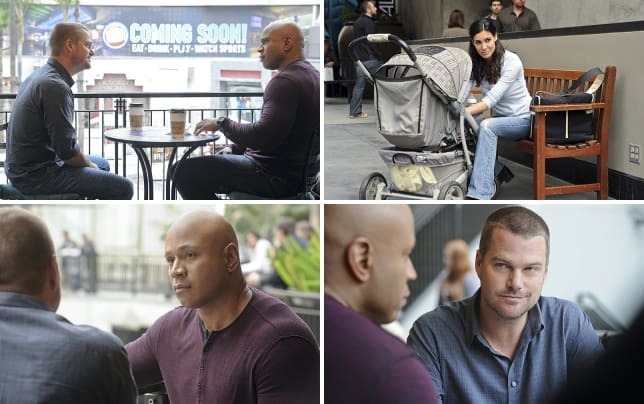 With only a few episodes left in NCIS: Los Angeles season 5, there's still more to be uncovered about Deek and Kensi's relationship and the White Ghost case in Afghanistan hasn't been entirely resolved. One main character has been rumored to be leaving the show this season. If I had to chose someone, it would be Granger. He's been a sore spot on the team since he arrived, but I doubt it's him. Which main character do you think won't return next season?